How many times have you seen The National? Where/when? Which show did you enjoy the most, what songs have you heard etc, whatever else you feel like talking about. Re: How many times have you seen The National? I'll go first. I've seen them four times, once on the Boxer tour (Jan 2008) and three times on the High Violet tour (twice in Jan 2011 and once in Nov 2011). The best show for me was the second of the Jan 2011 shows, the setlist was just better that night, the band was on fire and they played About Today. I was front row and Matt screamed the words to the last part of England into his microphone about 5 inches away from my face (me screaming along with him - I wouldn't be surprised if some of my voice made it out of the PA speakers). The first show was really great too, they were nowhere near as popular yet so were playing a bar that had a capacity of about 300 people so it was really intimate. I had only been into them for a short while but had been listening to Boxer and Alligator long enough to appreciate the songs. The only song they played that I didn't know at the time was About Today. I really kicked myself when I fell in love with the song later on, until I finally got to heard it again a couple of years later. I was trying to figure this out on my way home from Milwaukee. I think I've seen them 12 times. So I guess that's 13. My favorite would have to be The Double Door. That second night at the powerstation is still in my all time top 3 gigs, just amazing!! We must have been about 2 rows behind you. I've only seen them 3 times back to back in Jan 2011. Looking forward to them coming back next year. I've seen them twice, both in KC (Uptown Theater in 2010, Starlight Theater in 2011 w/ Arcade Fire). Just once in Detroit and it was phenomenal! I've seen them three times (Knoxville, Atlanta, and Indy (w/Arcade Fire). I think Knoxville was the best. I was sitting right up front. I had only heard Alligator a little and Boxer, but seeing them live was really eye opening. They played almost nothing I knew. They were headliners for the Big Ears festival so in the spirit of the festival they said they were going to play mostly new stuff. As a result, I heard most of High Violet. It was really mesmerizing to not know any of the songs but to care immediately. Best band for sure. Can't wait for Asheville in a few weeks! I've seen them 4 times now. I think the Orpheum Theater show when they played for Obama was pretty memorable and cool I thought. Favorite was The Pagent in St. Louis, small intimate venue. Matt walking on small table in front of you, jumping down beside you was quite exciting, and not even the best part. I have only seen them twice. I wish I could go back in time and see them on the Boxer tour, because that is my favorite album, but I missed that boat. So, I saw them the first time on the High Violet tour at The National in Richmond, VA. 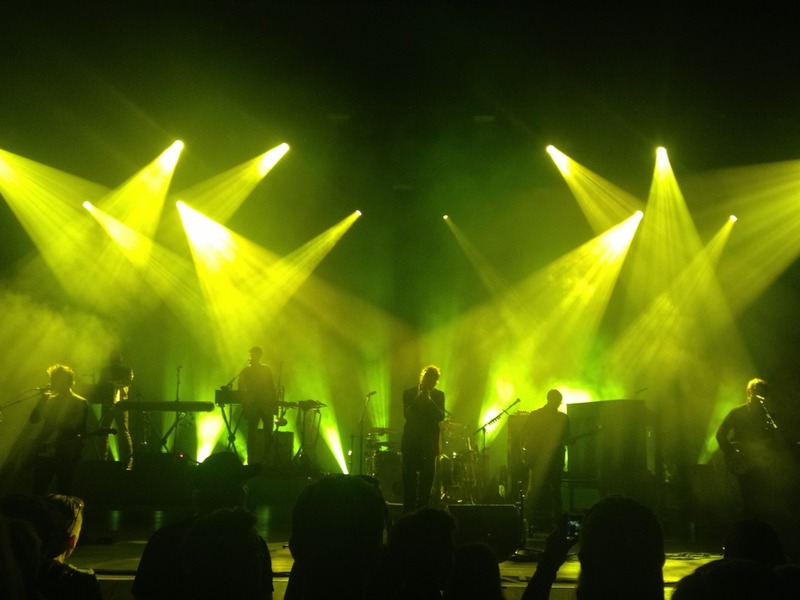 I had a really enjoyable time saying that I was going to see The National AT The National. Then, I saw them on the Trouble Will Find Me tour at Barclay's Center in Brooklyn, NY. I happened to be in NYC the week they were there, and their shows within a few hours of me were happening either right before or right after my trip, so I decided that it'd just make more sense to go see them while I was in New York. Both shows were good, but this one was a better overall experience. I was in a different frame of mind, I think. I was a little nervous about leaving in the midst of such a huge crowd, so I started to walk out right at the end, but then they started singing Vanderlyle Crybaby Geeks a capella, so I stopped in my tracks and listened in a state of bliss. Then, getting out turned out not to be so bad. It's amazing how quickly New Yorkers can disperse in the subway system. Hearing the new stuff live last night was a game changer. Up to 15 now that I saw them Twice at the Chicago Theater this week. Just once, at the Fox Theater in Oakland. Would love to see them again. Sadly I'm not going to be in NYC this summer, I would have loved to see them play at the Prospect Park bandshell in Brooklyn - they're doing three shows there this summer.